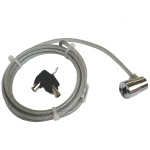 This laptop security device consists of a PVC covered steel cable with a loop at one end and an industry standard Kensington Slot (security slot) fitting at the other. It is designed so that the wire can be looped around a suitable immovable object or fixing, and then connected when required to the security slot on a laptop. The laptop attachment is made using keylock, and two keys are supplied.